These brilliant caves were revealed when two lovers went for a romantic boat ride at sea, in 1826. The caves sank about 15 to 20 meters below the present sea level due to some geological circumstances and hence almost all access to light was blocked, except one which gives the caves their two fold color and enchantment. Along the end wall facing the breach of access, the Grotta lengthens out into a rocky cavity about a metre above water level, and this cavity is accessible by a small landing step covered by Roman concrete work; while a square opening in the shape of a window which is accessible from a step evidently cut by human hands is opened in the wall of the rock just opposite the entrance. From Capri (Marina Grande): Reach by motorboats, thereafter transfers are arranged on rowing boats. From Anacapri: By bus with departures from the terminal at Viale De Tommaso ; By taxi from Piazza Vittoria (10 mins. ); On foot, along the Via Grotta Azzurra (from Piazza Vittoria - along Via Pagliaro - Via Tuoro). Then transfers are arranged on rowing boats. How popular is Blue Grotta? 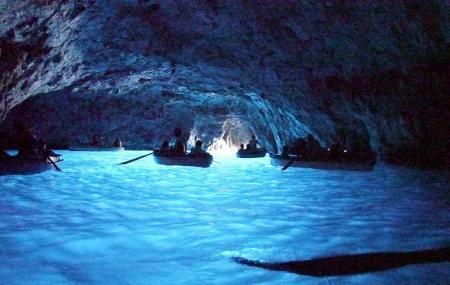 People normally also visit Anacapri while planning their trip to Blue Grotta. One of the most impressive views ever! Stunning scenery inside the cave. Make sure your luck is good enough to get in! Note: no windy, no high tide, and good weather! If you are going to Capri it is a must if you can. Most tours will include it but depending on thw ocean you may or may not be able to get in. Most of the row boat guys expect a tip €5. If you have trouble with boats beware some tours require you to move from one boat to another, while others drive you to the other side of the island where you can get on a boat from land (much easier) so try and find out. Well worth the money and the wait!! I cannot express this enough. Absolutely beautiful and amazing. Small boats as the cave entrance is low, so only 4 people per boat.